At the Moto X4 India launch event, the company announced key details such as the variants, price, release date, launch offers, and other availability details of the handset. The smartphone comes in two variants, with the Moto X4 price in India for the 3GB RAM+ 32GB storage variant priced at Rs. 20,999, and 4GB RAM + 64GB storage at Rs. 22,999. The smartphone will be exclusively available via Flipkart online and Moto Hub retails stores offline. The highlights of the handset include the dual rear cameras and the IP68-certified water- and dust-resistant body. Moto X4 will go on sale in India at midnight on Monday, with launch offers such as exchange discounts, up to 10 percent off on HDFC credit and debit cards, buyback guarantees, and EMI schemes. At the launch event, the company highlighted features such as the dual rear camera and its smart capabilities. For example, the phone will be able to present information about landmarks when the camera recognises them. Similarly, pointing the camera towards a barcode will show you the details of the products and links to buy it. 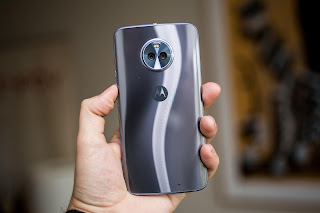 The Moto X4 dual rear camera setup consists of a 12-megapixel dual autofocus sensor with f/2.0 aperture and 1.4-micron pixels, and one 8-megapixel ultra-wide angle sensor with 120-degree field of view, f/2.2 aperture, and 1.12-micron pixels. The setup features a colour correlated temperature (CCT) dual-LED flash and PDAF. It brings a host of features like ultra-wide angle shot, professional mode, depth detection and depth effects, selective Focus, selective Black & White (beta), background replacement (beta), spot colour, landmark/object recognition, scan barcodes/QR codes/Business cards, panorama mode, slo-motion video, best shot, beautification, and filters. The handset will come in Super Black and Sterling Blue colours in India. Running through the specifications, the Moto X4 comes with Android 7.1 Nougat and supports a single-SIM slot (Nano). However, we can presume that the Indian variant will support dual-SIM cards. It features a 5.2-inch full-HD LTPS IPS display with 424ppi pixel density and Corning Gorilla Glass protection. It is powered by 2.2GHz Qualcomm Snapdragon 630 octa-core SoC coupled with 3GB of RAM. With phones with 4GB RAM becoming quite common in India, we may get another Moto X4 variant in the country. The front camera packs a 16-megapixel selfie sensor with flash support. It is backed by a 3000mAh battery with support for fast charging. The handset sports a metal unibody design and packs a fingerprint scanner under the home button at the front. It also comes with a USB Type-C port and 3.5mm audio jack which are found on the bottom of the handset.